St. Albans extends its condolences to the family of President George H.W. and Barbara Bush, including their youngest sons, Neil M. Bush ’73 and Marvin P. Bush ’74, who attended St. Albans while their father served in the U.S. House of Representatives and as U.S. Ambassador to the United Nations. Longtime custodial staff member William Milburn, President George H.W. 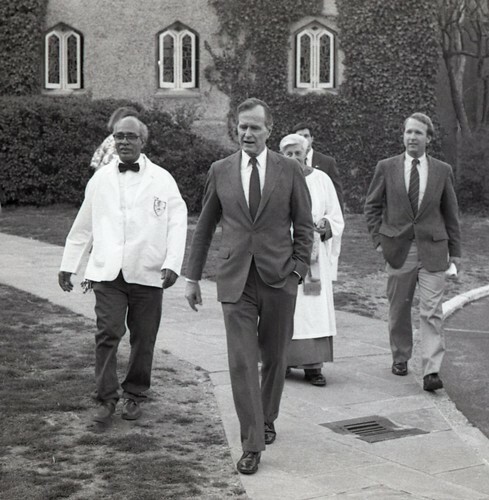 Bush, Canon Charles Martin, and Neil Bush ’73 outside the Little Sanctuary in 1989. The Bushes were deeply engaged in school life, with Mrs. Bush an active member of the Mother’s Club (now the Parents’ Association), Congressman Bush hosting class trips to the U.S. Capitol, and Vice President Bush jogging regularly on our track. 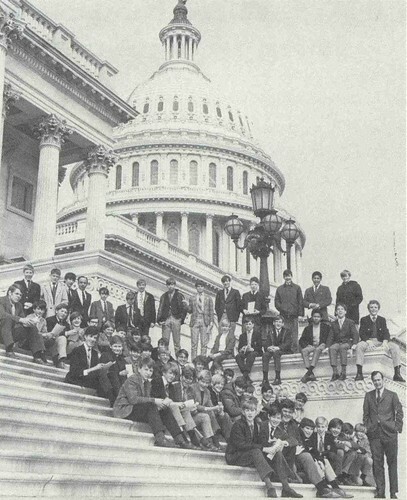 The Class of 1974 joins then-Congressman George H.W. Bush on the steps of the Capitol. 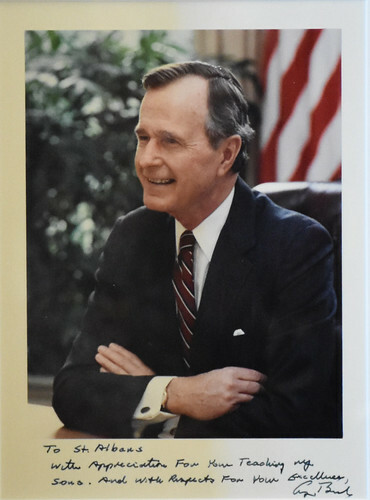 After his 1989 inauguration, the St. Albans Bulletin featured President Bush on the cover; he was, after all, only the second former school parent elected to the nation’s highest office – an honor he shares with President Franklin Roosevelt (father of James ’25 and Elliott ’28). The president thanked the school for educating his youngest sons with a signed photo: “To St. Albans with appreciation for your teaching my sons. And with respect for your excellence—George Bush.” His presidential medal, given to the students and staff of St. Albans, is included in the Marriott Hall display case honoring members of the community involved in service to the country. 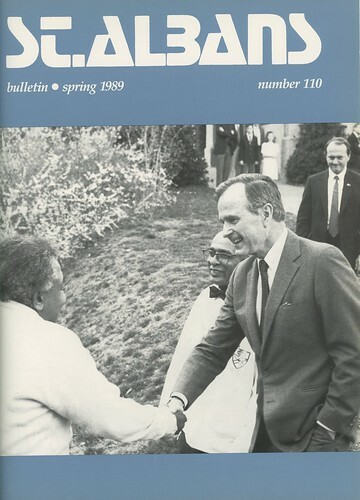 The cover of the April 1989 St. Albans Bulletin featured President George H.W. Bush and school chef Lester Washington, pictured when the Bushes returned to campus, two months after the inauguration, for their granddaughter’s baptism in the Little Sanctuary. The George H.W. 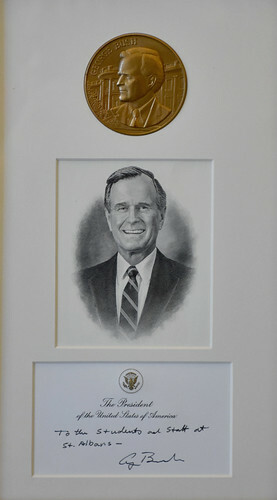 Bush Presidential Medal is featured in an Upper School display honoring members of the community who have served our nation.